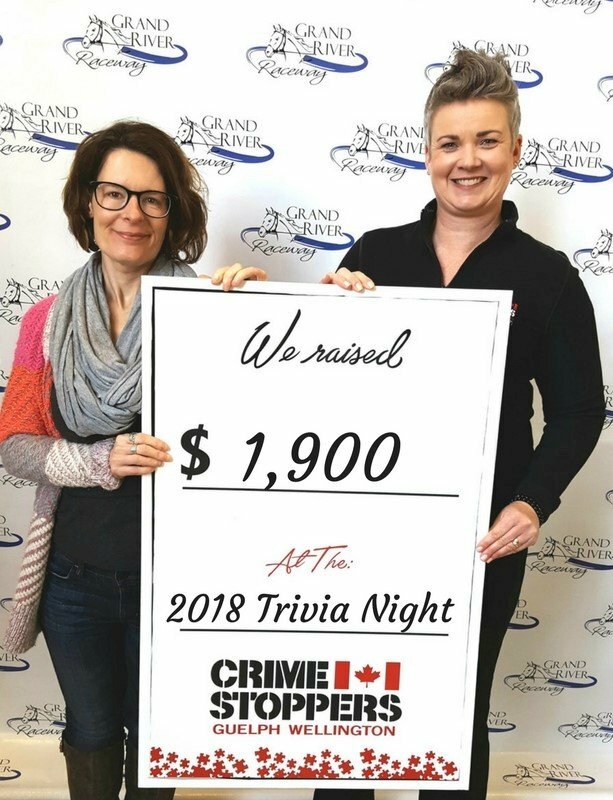 On February 17 the 2018 Trivia Night at Grand River Raceway raised $1900 for Crime Stoppers Guelph Wellington (CSGW). 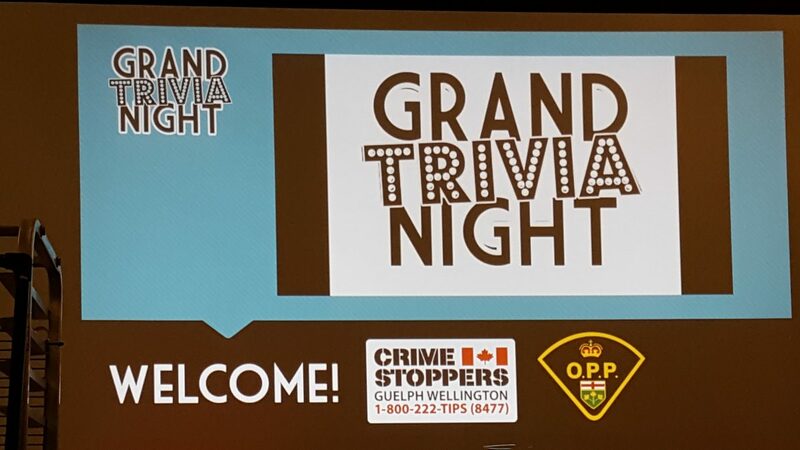 It was a sold out event that saw a room full of enthusiastic supporters vying for the $250 top prize to win over the Wellington County OPP “Pro Team”. Twenty-eight teams competed with three rounds of True Crime Trivia. Bonus points were awarded for additional tasks, and alternatively, punishment doled out for participants who failed. A few in the audience got “locked up” for a few rounds of trivia, including Wellington County OPP Detachment Commander Inspector Scott Lawson who good naturedly went along with the festivities while teams tried to decipher the clues leading to the correct combination to free him. 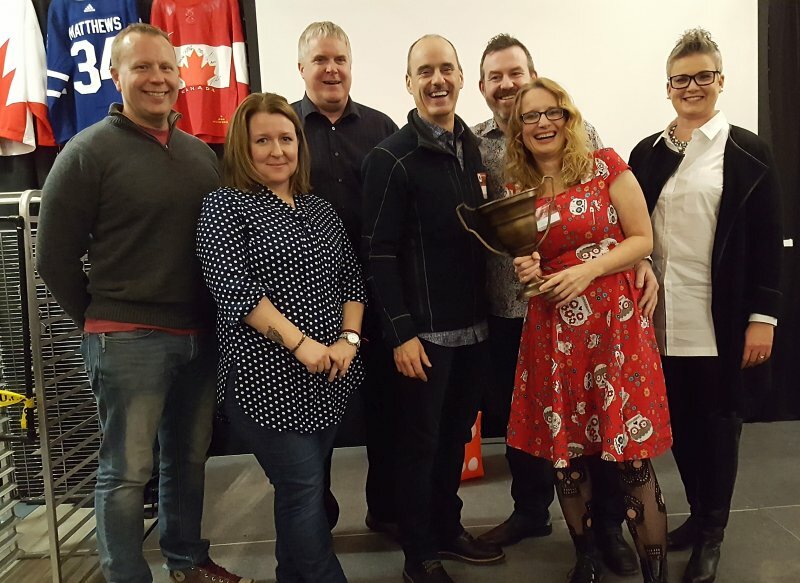 Wellington County OPP sent a team to represent and were the challenge of the evening as the top prize of $250 would only be awarded if they could be beat. Participants were invited to come in costume and the local media had a high spirited team, which added to the fun factor of the night as only a team dressed as extroverted retro journalists could! Trivia and high jinks weren’t all that added to the entertaining and lively evening. A mashed potato bar with all the fixings supplemented hungry tummies. Silent auction items were generously donated by local businesses and individuals. With portions of the ticket sales going to the funds raised as well as bids on auction items the total amount of $1900 was raised to go towards CSGW good works. CSGW requires ongoing fundraising as cash rewards are offered to Tipsters who provide valuable information that leads to arrests for crimes in our community. If you would like to learn how to partner with CSGW, go to csgw.tips “Contact Us” or call 1-800-222-TIPS. « Previous Article Breaking News: 2018 Canadian Water Ski National Championships Coming To Puslinch!